Which apps won't work in MacOS High Sierra? With MacOS High Sierra due to hit our Macs on the 25 September you may be gearing up to install it. But before you do, be sure to check that you won't be left high and dry when you try and run the Mac apps you rely on. The last time there was this much upheaval in terms of non-compatible apps was when Apple stopped shipping Rosetta in Mac OS X 10.7 Lion. Rosetta was Apple's tool for translating apps to run on an Intel processor. When Apple initially moved to Intel, Rosetta served to translate legacy apps, but following the release of Lion those old apps were no longer supported. With the advent of High Sierra comes a shift away from 32-bit apps - although luckily this isn't a complete move away from 32-bit, yet. MacOS High Sierra will still support 32-bit apps, but Apple has said that all apps sold on the Mac App Store should be 64-bit from January 2018. So when it arrives in 2018 MacOS 10.14 will not support 32-bit apps at all. A little bit like the way iOS 11 doesn't support 32-bit apps. Read about that here: Which apps won't work in iOS 11? Here are some of the apps that we know won't work with MacOS High Sierra, and some that might work, but aren't being supported. Some of these apps are Apple's own! 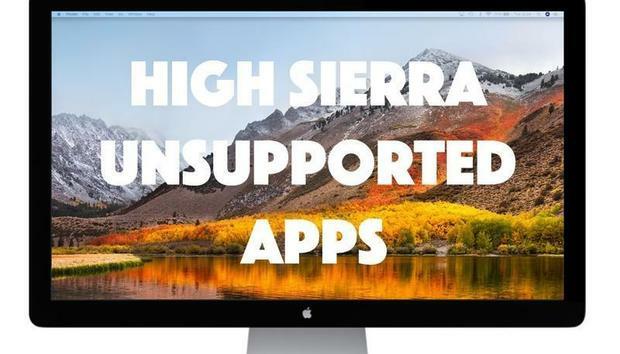 For more information abou what to expect from High Sierra read our review of High Sierra here. Apple used to bundle a number of apps with Final Cut Studio and Logic Studio, both of which are now discontinued and replaced by Final Cut Pro X and Logic Pro X in 2011. If you are still using these older suites note that none of these bundled apps, which included DVD Studio Pro, Soundtrack Pro, Colour, Cinema Tools, and more, will work with High Sierra. If you had updated to Final Cut Pro X and Logic Pro X you aren't necessarily out of the water. Only the following versions are compatible with High Sierra, so if you are running an older version than the ones listed below you will need to update. You can update to the latest versions on the Mac App Store, links below. Microsoft has announced that this will not be offering "formal support" for it's Office 2011 apps in macOS 10.13 High Sierra. Support for Office 2011 for Mac is due to end on 10 October 2017 anyway. The company also says that if you are running Office 2016 for Mac you should update to version 15.35 or later. Update to the latest version of Microsoft Office here. Adobe warns that 2017 releases of Illustrator CC (and earlier) were not designed, nor supported to run on macOS 10.13 (High Sierra) Beta builds. Users of Adobe Photoshop CS4 may also encounter problems. Update to the latest version here. As we mentioned above, when Apple unleashes the new version of macOS in 2018 support for 32-bit apps will have ended. Get ready for that now and check which of your apps are still 32-bit. In the final column you can see whether it's a 64-bit application. Find out how to install High Sierra on your Mac and how High Sierra compares to Sierra.